There Is So Much Wonder in Wonderful! Friends, I thank each of you who sent notes about the passing of both of my friends, Gail and “Duck”. Last week’s Post was very special to me and I am happy it resonated with several of you. This week, it is all “wonderful” news to share! First, a huge shout out to Aunt Katherine. She was on the Oscar stage last night with her three new friends who stared in “Hidden Figures”. She was the brightest star among them all. Her standing ovation was a clear sign of heartfelt love and appreciation for the well known achievements during her life and for her humble and classy style. One of the most telling comments she has been reported saying is…”I was just doing my job”. Without a doubt, Aunt Katherine would agree with me that the same is true for my other three living aunts I am blessed to still have around. They are all different and huge achievers in their own right. Each one stands very tall and are highly respected among their friends, community, and family. Each one has been such a special influence in my life. I just love each of them and today, I rise with my other aunts in saying to Aunt Katherine…wonderfully well done! Now, if some of you are just now coming on board and not aware of Aunt Katherine, I suggest you either buy/read the book “Hidden Figures” or check the movie listings. The movie is still showing around my town but soon it will likely be on Pay for View. As I have mentioned to several friends, when you leave the movie after viewing the story, you will depart with a special sense of national pride, hope for our collective future, and more educated on part of our hidden history. And, because of its wholesome presentation, there will be no filth to wash off afterwards. Oh yes, there is even more “wonderful” news! Thanks to my quasi brother Charles, my high school friend and much more, we have reached our goal of $2,000.00 for the ED Position. Charles thought I was pointing to him in my previous Posts about not yet receiving promised checks. I am happy he has a sense of humor. He is one of the good guys! So..thanks to Charles and the rest of you who really do something very amazing. I know as well as the next how difficult it is to share some of that hard-earned/well deserved money most of us have retired on and then pass it on to a community you do not know personally and may never visit. I do not take one dime for granted and I believe it is my job to be accountable for every cent of donated money. Last week, I announced we completed our fund-raising campaign for the Anne G. Broady Scholarship Fund. Another huge success thanks to so many. Within less than 40 days, we reached our fund-raising goals. Achieving both goals before the end of February has not happened before. So Charles, Eric, Bob, Jim, Lin, Lisa, Stephanie, and so many other donors, I thank you! Not done yet!…Meet Katie Love! One of our new volunteers at the Learning Center is an American from Aurora, IL (suburb of Chicago). Katie received her Bachelor’s Degree from Northern Illinois University in Spanish Language/Literature with a minor in Latin American Studies.This is her third time traveling to Costa Rica. The two previous times where to study Spanish in San Jose as a student. She also traveled to Granada, Spain for a semester to study Spanish. She has a passion for traveling and learning about other cultures. She has done substitute teaching and in her free time she is all about animals and the environment, runs and hikes outdoors, practices her Spanish and spends time with her family. It is “wonderful” to have you at the Learning Center. In closing, be certain that it is not my style to tease or inflate “Friends” with news of the great and “wonderful” things being experienced both at the Learning Center and elsewhere you will find “Friends” to be located. There is much going on and soon more information will be shared about the developing plans for a new Learning Center. It is hard to believe but this time now and in the near future, we will have so many “wonderful” reasons to be encouraged and enthusiastic about in many various ways. This is not the time to leave or lose interest. Stay on the train…its going to some great places. The report from the Learning Center indicates the first week of activity went well and there has been much enthusiasm for learning. We now enter week two and I am sure there is still some settling in that is needed. We have officially completed the 2017 Ann G. Broady Scholarship Fund Drive. This has been an extremely successful campaign. Although I am still running to the mailbox and checking emails constantly for a few delayed and promised donations, we have achieved our goal of getting 15 or more kids enrolled. This is our 4th year… THANK YOU! The Executive Director’s Position fundraising is still active. We are edging closer each week to having this goal met. The amount raised is far ahead of the previous two years at this point. This success will not require any additional local fundraising efforts to complete the goal. If you are inclined to support us on this, your donations of any amount will be gratefully accepted. borrowed their little Chevy Nova car to get to work and back which was a “life-saver”. I spoke to Gail awhile back and it was easy to tell, not much had changed in our relationship after more than 45 years. Peace be with him and with Jane and her family. A Life Full of Love, Grace, and Gratitude! was born, was the one who gave me a much-needed job in the campus kitchen that kept me from starving, and a great friend ever since, we always had lots to talk about. He was a Christian extraordinaire! “Duck”…enjoy your new home. Now…As I was writing this Post, a Skype call came in from my friend, Claudio Pacheco, who resides in San Jose, Costa Rica. He was a tremendous host during my last visit to Costa Rica in 2013. I regard this to be my BLESSING for the day! It was a true joy to see and speak with him via Skype after about three years. Thanks Claudio! The Learning Center’s doors have swung open and more than 58 students will be storming through to learn English among other topics including conservation, recycling, and other environmental studies. There will be other lessons in life learned at the Learning Center…”Life 101″. Congratulations… We have met our minimum goal based on both the donations received and donations pledged to date. As we begin day one of the new school year, we are already making huge differences in lives of several young students. The Copey community is very aware of the support and impact our donations have on the families and the futures of their children. Your generosity is so amazing! Thanks. We are treated with photos of Fiorella and Nataly’s first day at the Learning Center. 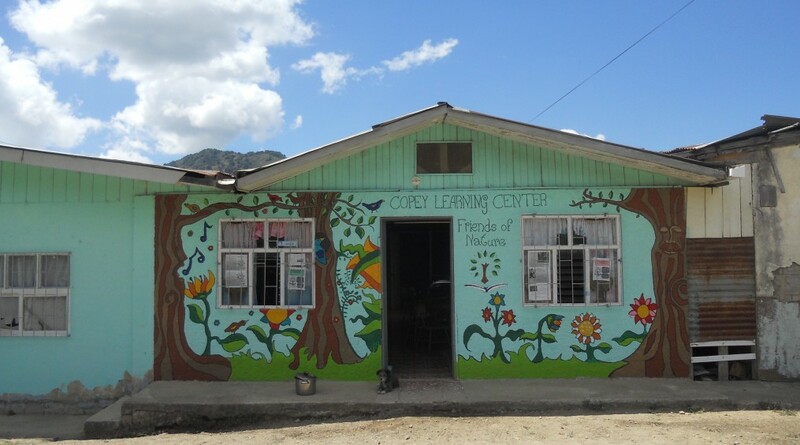 Their parents are convinced there is something very special about these “Friends of Copey” folks who willingly help make it possible for their children to attend the Learning Center. I commend the Executive Director, Ana Yancy and others who have been working very hard during the break to improve the curriculum and educational services for the students coming in to learn. Some conditions are not the best…and we know there are many areas that make it a real challenge to provide quality education. The Learning Center staff know how to make it all work. The enrollment increases and the demands for these educational services grow each year. We met two of the best examples of success in Noelia and Celeste. And we are getting ready to witness two more outstanding students with the arrival of Fatima and Ariana when they arrive in our country in June. The year 2017 will be a banner year because we are on target with our expectations, commitments, and plans to continue to find ways to enrich the educational experience at the Learning Center. The support for the ED position has also shown a lot of success. The amount donated already exceeds the amounts we raised at this point over the past two years. We are close to meeting our goal without having to do a specific fund-raiser later on. This is one indicator that many of you realize the value of having a very qualified and competent ED in charge of the day-to-day operations and the long-term success we all want. If you have pledged a donation, please send it in soon so we can close our fund-raising campaign. The new volunteer teachers are on board and ready to start off the new year. I am waiting to get more information about the two volunteers and will share it all with you once it is received. Speaking of volunteers, last week we had a very special Skype session. The Skype guests included Dr. Lin Church, Dr. Celeste Gaia, E&H College volunteer student Melody, and both Angela and Ana Yancy. Dr. Church, our co-Chair for the AGB Scholarship Fund sat in on our recent Skype session. This was his first time visiting with representatives from the college and from the Learning Center. It was a very special thrill for me to have Dr. Church join us and meet some of those significant players who help make “Friends” a success. The team in Copey met Melody for the first time and I believe Dr. Gaia met Ana Yancy for the first time. This is what a fine example of “partners at work” looks like. People from all parts of the US and in Costa Rica planning for events taking place in the next few months. I invite any interested “Friend” to take a couple of minutes to sit in on a Skype session. We are very pleased to welcome Melody Lipford, our 2017 selected Emory and Henry College volunteer student scheduled to journey to the Copey Learning Center in the Spring. Melody is currently a sophomore and is pursuing her degree in English and a minor in Spanish. She is a first generation college student, ambitious and very proud to be working towards her degree. Her personal interests include writing and singing. She is also an avid reader. I asked Melody to tell me something unique about her and she informed me that she is only 9 months and 3 weeks younger than her older sister. Okay…I agree that is unique because I am sure most people do not have a sibling this close in age. Similar to last year’s two E&H College students who volunteered to travel to the Copey Learning Center, Casey and Xavier, Melody is also a Virginian. Her hometown is in Pennington Gap. Melody loves meeting new people and looks forward to traveling to Costa Rica. This will be her first trip outside of the United States. I foresee this being a real life-changing experience for Melody and I invite all “Friends” to join me as we welcome her and support her on this new experience. Later this week she will begin interacting with Ana Yancy, the Copey Learning Center Director, as she starts her orientation on the country Costa Rica, its culture, and life in Copey. Melody will have the opportunity to meet and hopefully work with the two Learning Center students, Ariana and Fatima, both scheduled to travel to E&H College in June. This is an exceptionally wonderful arrangement having students from both the college and from the Learning Center with an opportunity to build a relationship. The Learning Center Looks Forward! “Friends” you have been extremely generous and supportive. The pledges and actual donations allow us to continue our support for 16 or more children and the Copey community is very appreciative. However, it is important to get your donations submitted if you have not yet. Parents and children are being notified and enrolled based on our total commitments to date and we would hate to withdraw a student because we overstated our support. Also, we are still making progress on raising funds for the ED position. We are over half-way and still tracking closely to last year’s donations and schedule. If you prefer I place the donation in PayPal for you, then you “MUST” send me a check or money order made out to me. Please do not make it payable to “Friends of Copey”. There is “no” Friends of Copey” bank account since we quickly forward the funds to the Learning Center and do not hold funds back. Once your donation is received, the deposit will be made into my personal bank account and the donation is then made using PayPal indicating the donation is from you. Over four years now, this system has worked very well. In closing, we all stand on the doorsteps of another year of promise and performance. We have a lot on our plate and many things planned for the year. Yes, we are ambitious and optimistic but this is how “FAITH” works on you. We believe! Thank you for all you do and please know that I am truly humbled by your generosity, interest, and support. Now…let’s go get this done!